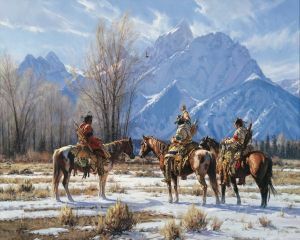 "A Crow (Apsaalooke) hunter raises his hand in prayer to the eagle as they pause on their late winter journey through what would become known as Jackson Hole. The eagle typified courage, quickness, and strength to the Native American, and was prayed to in order to receive those abilities. Perhaps in his vision quest he had received the eagle as his spiritual guide, and he is asking the eagle for help as they travel in search of elk. "The idea for this painting came from a trip to Jackson, Wyoming. As I hiked in parts of the area, with virtually no other human around, I was struck by the activity of the wildlife - coming upon elk, moose, bison, coyotes, ducks, geese, and an eagle - and of the silence broken only by the sounds they made."